Spading the dirt, we looked down into our hole. John grabbed handfuls of soil, grinding it between his fingers. “Look, nothing! No bugs, no worms, no seeds, no moisture — even through that hose is dripping away on top of the vine. Okay, quick, let’s get back.” Covering our tracks, we re-filled the hole and ran back to the Frog’s Leap property. “Okay, again, dig a hole. Anywhere.” One turn of dirt revealed something amazing. Worms, bugs, seeds, stems, roots, and what could best be described as ‘life energy’ permeated every inch. Keep in mind the two holes we dug were a mere 60 feet apart. The health of the Frog’s Leap property is immediately evident in a situation like this. “Squeeze that dirt, feel the moisture.” Rather that falling to dust, the dirt clumped together and cool moisture covered our palms. It was September in Napa Valley, and it hadn’t rained in three months. The vineyards at Frog’s Leap are dry farmed, without irrigation. 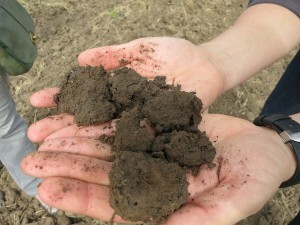 So how can the dirt have any moisture content? “It’s all about soil management” says the always jovial Jonah Beer, VP and Director of Sales, as he showed off the nitrogen nodule on a plant and the moisture holding content of the soil. “We establish the right cover crops to grow during the winter (Purple Vetch, Clover, Austrian Winter Pea, and many others) to bring essential elements to the soil, then we till alternate rows to help the bugs spread around, then we till everything just before summer hits. The dust settles on the vineyard like a blanket, holding in all the moisture. We don’t need to add any water.” Looking around it becomes evident: no long black tubes cascading from vine to vine. It’s not that dry farming is a new idea. 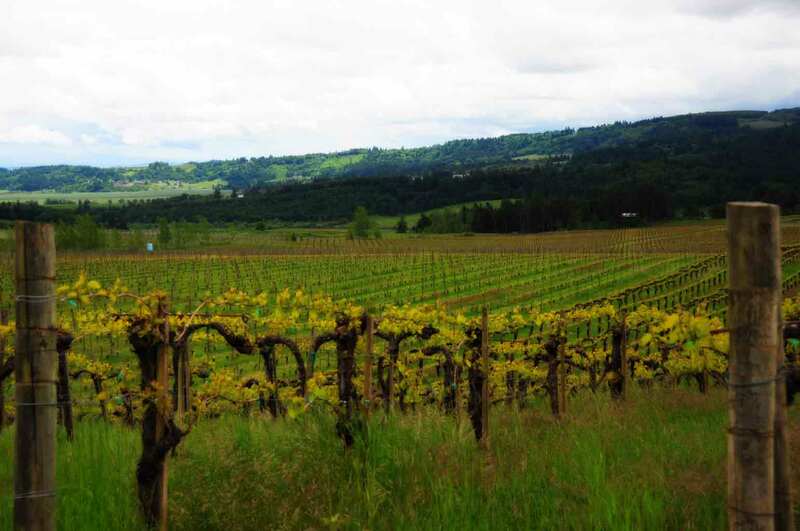 An interesting point to consider: all of Napa Valley was dry farmed until the 1970’s. All of the legendary wines of the mid 20th century from Inglenook, BV, Heitz Martha’s Vineyard, and even the 1973 Stag’s Leap Cabernet that won the Judgement of Paris? Dry farmed. Therefore, dry farming marks a new return to an old idea. Most vineyards managers and winery owners will look you straight in the eye and say growing grapes in Napa Valley without irrigation is impossible. “They’re right,” says Williams, “because of the rootstock they are using and the way they have planned their property, they need irrigation. To dry farm a vineyard you can’t just turn the water off. You need to consider these things when planting and establishing the property. 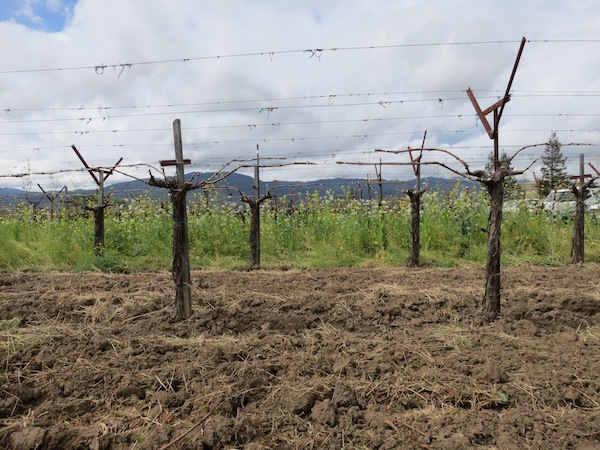 The right rootstock, healthy soil, and a long-term outlook.” Most wineries are thinking three days or three weeks ahead, whereas Frog’s Leap is thinking three years or three decades ahead with every vineyard decision. Look ma! No irrigation lines! How can this be? When farming the same varietals in the same terroir as his neighbors, why does this dramatic difference take place? (John’s 2010 Cabernet Sauvignon is 13.9%, while the one made right next door is 14.9%.) It’s not simply brix levels at the time of harvest, as you might expect. It’s more complicated than that. In the end, it returns yet again to the farming. Here’s the short version of how his neighbor’s grapes are grown: Take a vine, drip water spiked with fertilizers continuously on top of the roots, the roots form into a little ball simply sucking on this free water, the weeds (which, because the root spread is the size of a dinner platter, could choke out the vine) move in to get some of the water, so you kill the weeds with chemicals, but the nitrogen levels fall quickly, so you douse the vine with more fertilizer, spiking the sugar levels long before phenolic ripeness has completed. Additionally, because of the water and nitrogen spike, the vine grows too quickly and puts energy into canopy production instead of fruit quality. By the time of harvest, the vine is totally confused about what its goal is and you end up with high brix levels but the classic bell pepper aromas feared by many winemakers. This is why you’ll never find the bell pepper aromas in the Frog’s Leap Cabernet. By dry farming the vineyards and using cover crops to balance and control nitrogen levels, the vines can put all their happy energy into making great grapes. And in the end, isn’t that what the vine wants?